In the third and final part of our 2016 highlights series, we look at awards received by the Philadelphia Water Department and its employees as well some grants distributed last year. Thanks for following along—Part One and Part Two cover lots of cool highlights for those who missed those posts. Longtime PWD employee and General Manager of the Public Affairs Division Joanne Dahme was honored with a Dilworth Award for Customer Service, one of Philadelphia's most esteemed civil service distinctions. The Dilworth committee selected Joanne for her tireless efforts to serve the department's 1.5 million customers, from big citywide efforts to volunteering in her own neighborhood. We at PWD couldn't be more proud of her! Read more here! The Greater Philadelphia Sustainable Business Network and their sister group, the Green Stormwater Infrastructure Partners, introduced the Excellence in GSI Awards in 2016 and gave retired PWD Commissioner Howard Neukrug the first-ever GSI Leadership Award. 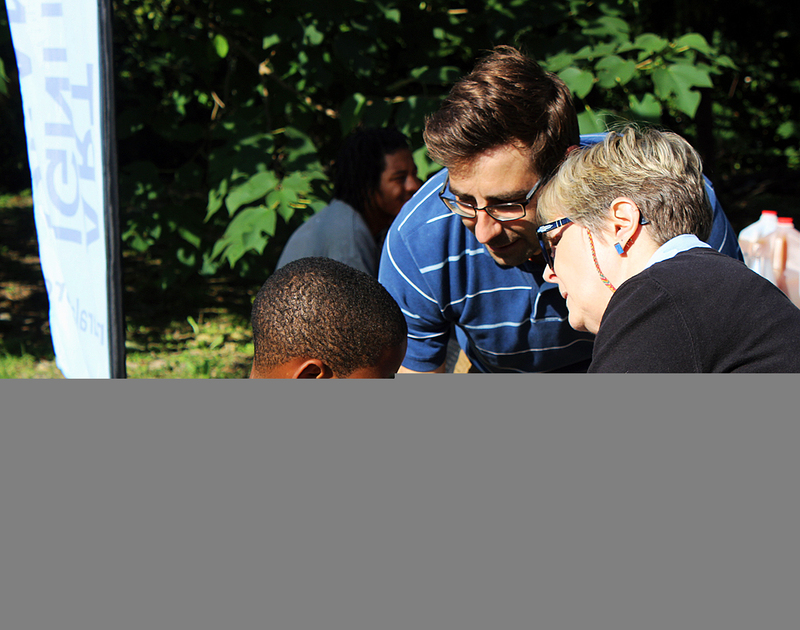 One of our Stormwater Management Incentives Program grant recipients, West Philadelphia's Lea Elementary School, also won Best Public Project for improvements that are helping to reduce stormwater runoff pollution while giving the students a more vibrant learning environment. In another first, the Green City, Clean Waters program and PWD took home the Climate Hero award at the inaugural Sustain PHL awards. What does a water utility have to do with climate change? More than you think! Read all about our work on climate issues and the award. In July, our Northeast Water Pollution Control Plant was recognized with a Platinum 11 Award from the National Association of Clean Water Agencies (NACWA) for 11 straight years of perfect compliance under permits regulating water quality at wastewater treatment plants. NACWA, which represents municipal wastewater treatment facilities across the U.S., also honored our Southwest Water Pollution Control Plant for five straight years of perfect compliance. Congrats to the teams at our Water Pollution Control Plants! 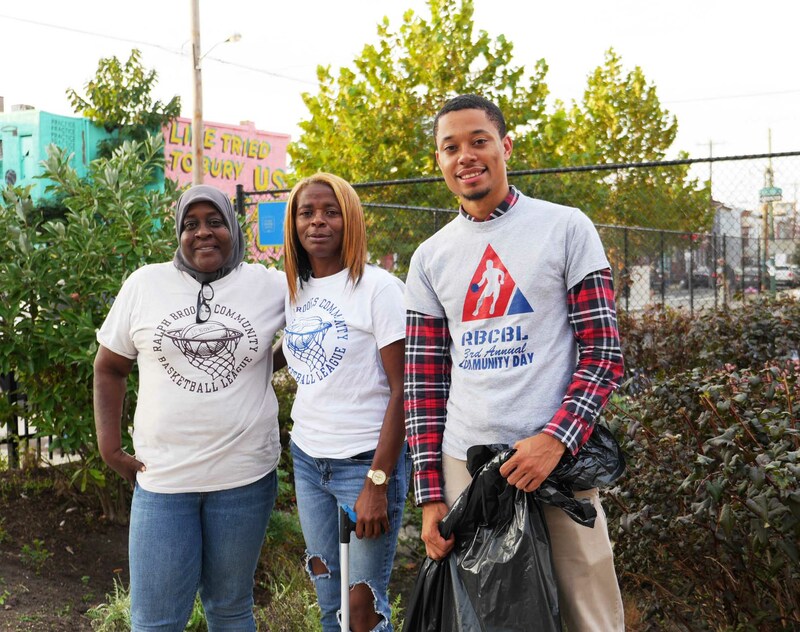 In November, our Green City, Clean Waters program was honored by a community not often associated with stormwater management—architects. The Pennsylvania chapter of the American Institute of Architects, AIA Pennsylvania, honored the multi-decade plan at their 2016 Architectural Excellence Design Awards Gala with the Contribution to the Profession by a Non-Architect Award. Read about that event. Drew Brown, a PWD engineer and member of the Public Affairs team, joined our resident historian, Adam Levine, in taking home a TTF Public Leader award at the annual Tookany/Tacony-Frankford Watershed Partnership Milestones Award Ceremony. Drew has served in a number of roles during his more than three decades of service to the City and department, and currently works to educate communities about issues like lead safety and water treatment. He's also the guy who takes Philly school students and other groups on tours of our treatment plants. Adam is an unrivaled expert in all things related to Philadelphia water history. Want to know when the Cohocksink Creek in Northern Liberties was buried and turned into a sewer? Or maybe you want to see newspaper articles about epidemics of water-borne disease that occurred before we figured out how to treat water? He can help. In addition to doing things like organizing an annual tour of the hidden Wingohocking Creek, Adam maintains the PWD archives and provides technical assistance when projects are expected to excavate in areas where former land use is unclear. Congrats to Drew and Adam! In 2016, PWD joined fellow partners in announcing nearly $279,000 in SRRF grants that will help protect the Schuylkill through eight investments in places ranging from rural headwaters to the North Light Community Center in urban Manayunk. The grant program is part of our overall efforts to support source water protection and water quality improvements locally and in the upstream watersheds that provide our drinking water—an import effort given that only a small portion of the Delaware and Schuylkill Rivers actually fall within Philadelphia's jurisdiction. Projects funded include improvements that help farmers prevent manure and fertilizer from getting washed into the Schuylkill and tributaries, acid mine drainage abatement, green infrastructure upgrades that reduce stormwater runoff pollution, and more. The Schuylkill River Restoration Fund is currently looking for new projects to support in 2017, and letters of intent are due February 16. Check out the grant guidelines, application, and past projects. Public projects are an important part of our Green City, Clean Waters program, but we also need private developers and business owners to invest in green improvements that the reduce stormwater runoff impacts of their own properties. While “SMIP and GARP” might sound like a funny 1970s sitcom, our Stormwater Management Incentives Program (SMIP) and the Greened Acre Retrofit Program (GARP) are, in reality, two important tools that encourage private investment in Philadelphia growing network of green infrastructure. In the last fiscal year alone, we awarded just shy of $11.4 million to SMIP and GARP projects. With SMIP, business owners like Gina Rucci, co-owner of Popi's Italian restaurant in South Philly, can get grants that allow them to design and build custom green tools for their property. In addition to protecting local waterways from stormwater and reducing sewer overflows, these projects add beautiful landscaping to businesses and neighborhoods. In return for their investment, SMIP participants can get reduced stormwater fees, making it a win-win for the environment and small businesses. See Rucci's story. GARP, on the other hand, is designed for private developers working on multiple properties. These grants allow contractors, companies or project aggregators to build large-scale stormwater retrofit projects that impact a number of sites. The July 2015–June 2016 tally for these stormwater grant programs includes 10 businesses that used SMIP and three GARP bundles that made green improvements possible at 21 sites across the city. Get more info on these programs and check out our SMIP Stormwater Pioneers! Philly Fun Fishing Fest: Everyone's a Winner! After a dozen years on the Schuylkill, this family fishing fest just keeps getting bigger and better! Sponsored by the Philadelphia Water Dept., Parks and Recreation, the Pa. 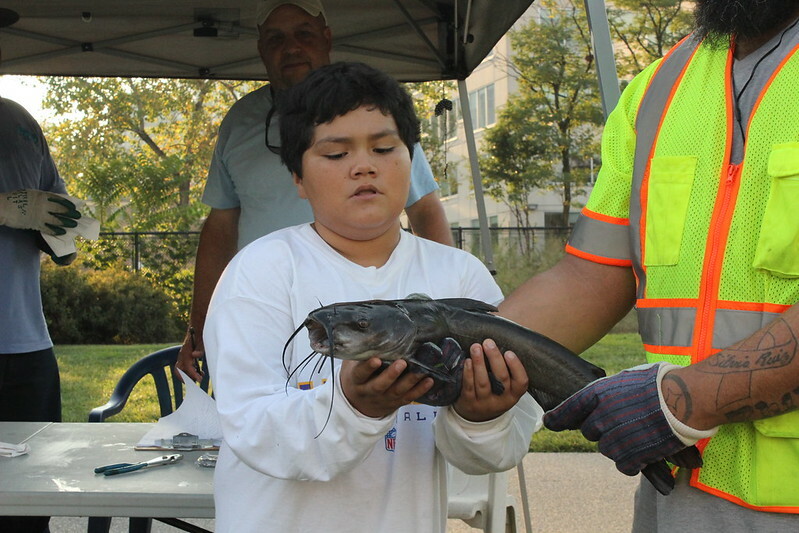 Fish and Boat Commission and Schuylkill Banks, the 2016 event had 195 participants and saw 297 fish caught and released. This lucky guy got some great prizes for an unusual catch: a 3-inch shad! Thanks again for reading through our 2016 highlights - we're already busy making 2017 another year of good news for our customers and waterways, and we hope you'll join us.